Since launching our Gaza Emergency Appeal a few days ago, we are providing an update on the latest heartbreaking statistics in Gaza from the United Nations Office for the Coordination of Humanitarian Affairs (OCHA) as of yesterday: 1,065 Palestinians killed including at least 795 civilians of whom 229 are children and 118 are women; 44 Israeli soldiers killed and 3 civilians; 6,233 Palestinians injured of whom 1,949 are children and 1,160 are women; 215,000 are displaced and in need of shelter, drinking water, and food assistance; 44% of the Gaza Strip encompassing a 3-kilometer wide strip is declared a no-go zone; 194,000 of children are in need of psychosocial support; 3,695 families whose homes were totally destroyed; 4,235 families whose homes sustained major damage; 24,500 families whose homes sustained minor damages; 133 schools damaged; and 22 health facilities damaged or destroyed!! The number of Palestinian casualties is increasing daily and will increase even if the hostilities end. It is estimated that hundreds more are buried under the rubble and it will take days or weeks to dig up all of the bodies. What is really sad about it all are the accusations that women and children are being used as 'human shields' with total disregard to the fact that 1.8 million people are now living within an area of some 200 square kilometers which was already overcrowded before the war started. Is there any safe place left for them to take refuge and cover? The above statistics are appalling to say the least, but what is more difficult to comprehend are the personal stories that I hear from our various friends and partners. The targeting of the Ayyad family home just yesterday was most disturbing. 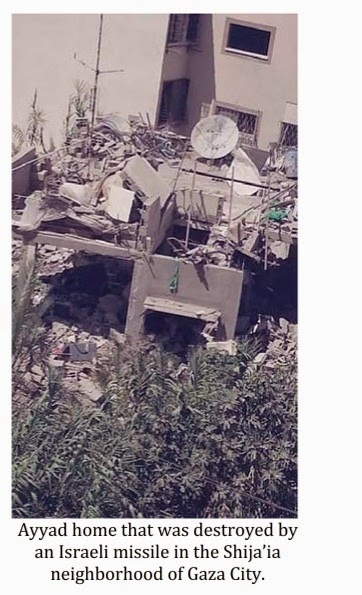 The first Christian victim was a 60 year-old woman named Jalileh Ayyad who did not have enough time to flee; she was killed instantly when a missile hit her home. Her 32 year-old son Jeries who was with her at the time, was critically wounded in the attack suffering from severe burns and shrapnel fragments on 60-70% of his body and doctors had to amputate both his legs to save his life. He will be brought to a Jerusalem hospital for extensive treatment so that he will have a better chance of survival. Jalileh was buried in the Greek Orthodox cemetery in Gaza late yesterday afternoon. I received an urgent call two days ago from Suhaila Tarazi, director of the Al-Ahli Arab Hospital in Gaza explaining the urgency for medicines, medical supplies and more importantly, fuel to operate the hospital's generator. She reported that the hospital had to make a painful decision to shut down their generator for 4 hours that afternoon in order to ration fuel. She was very upset not knowing what affect it will have on the patient's treatment and recovery. We immediately lobbied with our connections to ensure that the hospital gets the fuel supply it needs to continue to save lives. Muslim women and their children who have nowhere else to go taking refuge at the Greek Orthodox Church. Today, as he was describing to me the status of Jeries Ayyad - the injured son of the late Jalileh who is in the hospital, the building across the street from George's home was being shelled and he had to take cover immediately! Our Churches and Church institutions continue to be that beacon of hope in Gaza despite all of the misery. The Holy Family School, the Greek Orthodox Church and the Greek Orthodox Cultural Center have all opened up their facilities to hundreds of displaced families, giving them food, clean water, and above all, a safe roof over their heads. The Al-Ahli Arab Hospital continues to open up its facilities in this emergency crisis to anyone with all medical treatment and care free of charge. Fr. Georges Hernandez continues to risk his life every day making home and hospital visits. 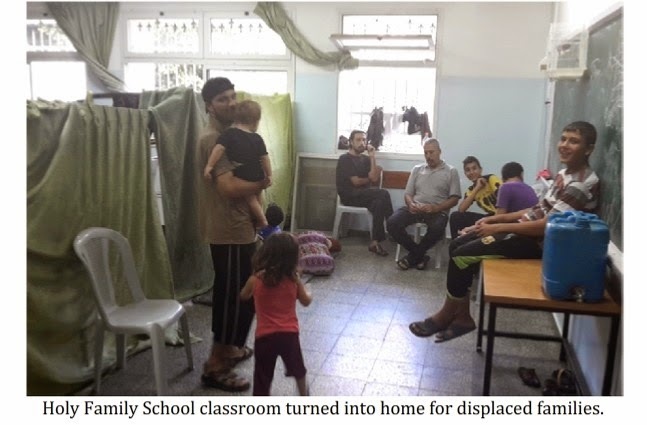 The Daughters of Charity continue to call Gaza home despite the various offers for evacuation. Within our Christian community and institutions, despite all of the suffering, the Christian mission is certainly at its best. These brave souls who are personally risking their lives not knowing when their homes or the institutions the visit or operate will be hit by an airstrike, continue to comfort the injured and displaced, provide assistance and services to the weak and marginalized and do it with the Christian values at heart. I would like to take the opportunity to thank all of our various donors who already responded positively to our appeal, and to those whose circumstances do not allow financial support at this time. Please know that your moral support and prayers to the people of Gaza, especially the women and children, is priceless and is helping to keep hope and faith alive.